Most anyone that has talked for any length of time knows that I am quite the advocate of cloud computing. Storing files, sharing documents, allocating computing power, running websites, retrieving email, communicating with friends... I do all of this "in the cloud" right now using either our own software or Software as a Service. However, I wanted to know what you think about another type of application that has been released by Google now: Google Health. you own your medical records and should have easy access to them. The way we see it, it's your information; why shouldn't you control it? The question for me is how will the doctors, pharmacists, hospitals and other health care providers view this. 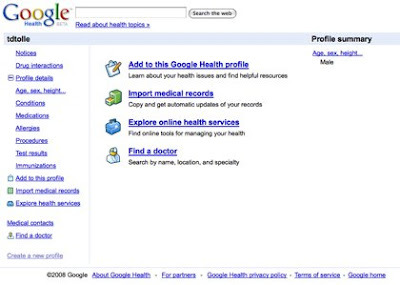 Will they truly take your records that you post onto Google Health and share information back with you there? I hope that this does take off and that adoption is fast and furious, but I have my doubts. Hospitals and medical offices complain over and over again as it is just in the move to electronic medical records from their paper ones. I think that this might taint their view of yet another step in the process. However, the solution might be other service providers that would interface the record systems with Google Health. Another issue is security... I know how I feel about my records being out there in the cloud, but I am wondering how the general public feels. You are in control — you choose what you want to share and what you want to keep private. I encourage you to go and check it out and let me know what you think! I know that there are not many providers right now that integrate, but when they come on board, will you? I have my account and am waiting for the providers in Western North Carolina to get on board. Check out About Google Health and tell me what your plans are in the comments and take the poll to the right.